This is almost a subcategory of "gamer's games", actually. It should be more properly called "GAMES OF NO LOTS", since I include here games that do not use randomizers (dice throws, card draws or similar), al least in the basic mechanics of riders' movement. Some of these games, though use (or allow the use of, as a variant rule) random events (like punctures or falls) often in the form of monopoly-like chance cards or even dice throws. Of course, "Games Of No Chance" is the title of a series of books edited by Richard J Nowakowski, which study two-person full-information games, and I should not be using the same expression here. Still, I like it therefore I use it. 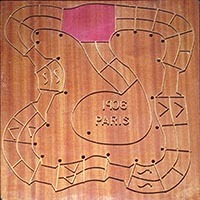 See "New Directions In Cycling Board Games" for more on games of chance and no chance.